Alcatel has just announced the release date of One Touch Tribe 3041D here in the Philippines, according to Alcatel it will be released next week. At first sight you might think that One Touch Tribe 3041D is a Android smartphone. 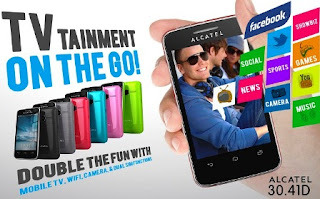 Guess what, you've been deceive by the looks, since Alcatel 3041D is no way operated by Android OS. 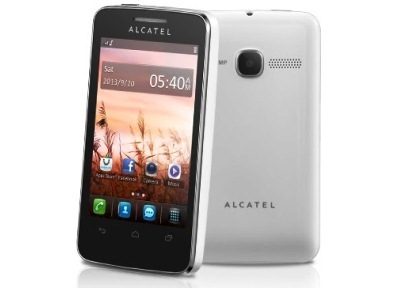 Still, having 3.5 inch display and with that Alcatel brand can make this phone great. Never underestimate the features of One Touch Tribe 3041D, as it give basic entertainment function all in all, watching free-aired television on-the-go, listening to radio, taking pictures, and yeah! It has a WiFi, plus it gives handling comfort with its 12.1mm body and weighs 98 grams. Alcatel One Touch Tribe 3041D is another mobile phone to look forward, specially to those who just want to have a nice basic touchscreen phone. One Touch Tribe 3041D is affordable at Php2,490 SRP. More details below. For Php2,490 | Available on the second week of August 2013 on Alcatel Mobile Stores, and authorized sellers nationwide. You can say its weak, you can't install apps, limited possibilities. But one thing is for sure, that One Touch Tribe 3041D will have long lasting battery compared to Android operated devices. Kindly share your experience with Touch Tribe 3041D after you purchase! Thanks. San po sa cavite merong mabibilhan nyan? Hindi po ako taga Cavite sir, better check the malls po.